The Full Moon arrives at 10 degrees of Libra on Saturday, March 31 at 8:36 AM EDT. Wherever the Moon is, there is splendor. No matter her phase; no matter her appearance, she is magnificent. The Full Moon phase is perhaps the most splendid of all. Her radiant orb looms largely above and upon us. We are filled with a sense of constancy. She evokes all manner of layered emotions, filtering the particles of confusion and unfulfillment from our psychic atmosphere. Her replete presence calls forth from us full spectrum consciousness in which to inform and inspire our process of transformation. From here, we proceed with vision of tremendous magnitude. One can liken this to an arduous yet successful mountain climb. We are standing at the top of the mountain with a clear unfettered view of the night’s spectacular sky, reflecting the radiant light which we all embody; yet, in which we darken with the unconscious threads of self-destruction which tether us to rocky ground. Herein lies a choice. We can view and experience the multidimensional realms before us; or, we can remain in the limited oppressive land of three dimensional reality which says, “All that you see is all that there is.” It is our choice. We all have the capacity and strength to shift our awareness. We only have to embrace this optimal cycle which is upon us. During the pinnacle of the Moon’s unwavering presence, light is shed upon our questions and concerns. A message is delivered to a relational circumstance or situation long pondered. Perhaps there has been something in particular that has been looming largely in the invisible background of our heart’s domain. That which is repressed becomes distorted. When we ignore the pure energy of enlightenment that the Full Moon offers to us, we can potentially become fueled with a sort of mania driven by the irrational forces of the unconscious mind. 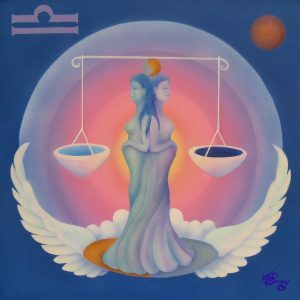 Libra The Scales is a cardinal masculine air sign ruled by Venus. The archetypes of Libra are The Artist, The Lover, and The Peacemaker. Libra’s qualities include equilibrium, love, relational expression, aesthetic sensibility, inner harmony, peacefulness, fairness, partnering, inner balance, and social etiquette. Libra embodies the ability to embody consciously both the shadow and the light. As each zodiac sign has an evolved manifestation coupled with a distinct shadow manifestation, Libra does so no less. Libra’s shadow emerges within the realm of relationships most of all. Libra fears conflict, thus prone to over-compromise.This often results in people pleasing of the highest order. Thus, an opportunity to engage in healthy discourse can seem daunting. This in turn can be an act of self-betrayal. Libra longs for love; love of the courtly sort: the state of aesthetic love which emanates longing for balance and equality. When the scales are tipped, the Libran heart is torn asunder. 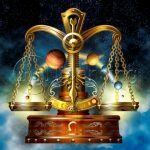 Wherever Libra resides in your star chart, there is tremendous longing for true connection and partnership. It is an area in which the aesthetics of grace, tenderness, and true partnership are both required and lived forthrightly. During this highly relational Full Moon, Mercury, The Messenger of The Gods, provides steady compansionship, offering a prime opportunity for open hearted communication. Mercury is a fine companion for the Moon, as he lightens her up and assists with an ever heightened awareness of the destructiveness of dualistic thinking. Both Libra and Mercury can see beyond the extreme rationale that only serves to divide and separate us from each other, thus mending the bridge to true compassion and understanding. This is a time to grow beyond duality. The recent weeks have been heavily fueled by Mars. Anger has been palpable. There may be regrets relating to our own words and behavior as well as challenges to forgive the irate behavior and unkind words of others. Mars reminds us of our inner warrior, demanding the delineation of boundaries within the realm of passion. The heart centered Libra energy is challenged at this time with a field of aggression. There is room for both, as they each are necessary. In pure Libra fashion, we can unite them as an efficacious collaboration for balancing relationship, both with the self and with others. The heart has four chambers. Are they balanced? Do they flow between each other? We can hold it all, as long as those chambers have equal distribution of the myriads of emotional understanding and lucid expression. We have a choice. Making choices poses challenges for Libra. So the feeling realm must be invoked by the higher self. For it is the heart that truly knows. As we embrace the first Full Moon of Spring, commune with both the light and the shadows that the Moon casts before us. They are reminiscent of the light and shadow that we exchange with each other. We all are mirrors. Who is gazing back at you? What do you wish to reflect upon the world? First we must look within our own mirror. Only when we embrace the reflection of the self, can we receive the reflection of another. Mutual reflection met with receptivity balances the heart. The balanced heart balances the world. When the world is balanced, our hearts are set free. Libra Full Moon Blessings Upon You.